If you are lucky enough to spend the night in Scott and Tess Van Wagner’s 1,500 square-foot, solar-powered log cabin hideaway in the Colorado Rockies near Telluride, you might wake up to the enchanting melodies of mountain bluebirds, courting just outside the upstairs guest bedroom. If you then venture out onto the stylish, cantilevered Truman Porch—named after the brassy 33rd President who commissioned a similar, though much grander, porch to be built on the south portico of the White House in 1948—you will be greeted by untamed nature as far as the eye can see. 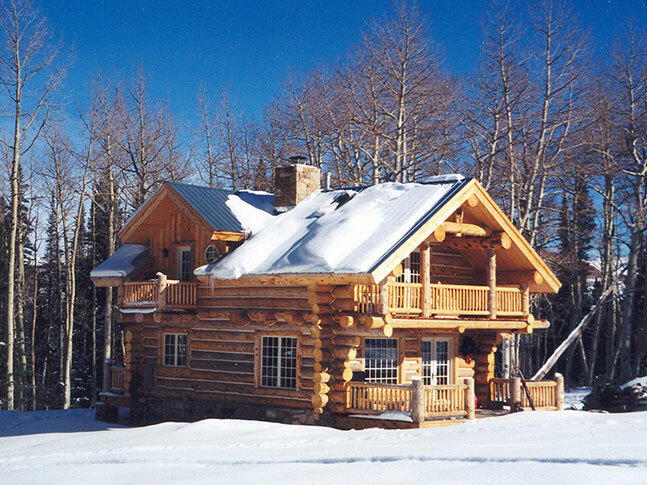 Through the 80-foot aspens to the north and west, you’ll see a towering forest of fir and spruce trees surrounding the mountain meadow where the cabin sits. To the south, the sunny, snow-capped summits of North Pole and Hayden Peaks look down on you from nearly 13,000 feet. And, if it’s a cool, crisp morning and the air is still, you may just hear the tunes of John Coltrane or Charlie Parker reverberating through the trees, compliments of Scott Van Wagner and his soprano saxophone. These days, the Van Wagners feel more in touch with nature than ever before, since it’s nature alone that provides the electricity to make life so pleasant and cozy in their hand-hewn vacation home. Though relatively small, the Van Wagner’s solar electric system was expertly designed and installed by Backroads Enterprises Mountain Power Company, out of Ridgway. Rather than having the components spread out, everything is located in, or on, the generator shed that lies 50 feet west of the house. The 320-watt array of Solarex photovoltaic modules is mounted on the shed’s south-facing roof. Inside the shed, the 24-volt DC current produced by the array is directed through a charge controller—a component designed to regulate the amount of current coming from the array—before moving on to a well-maintained bank of a dozen L-16 Interstate solar batteries. The final transformation is made by a Trace SW4024 sine wave inverter: 24 volts of DC current from the batteries goes in one end, and 120 volts of clean, AC house current comes out the other. The house is supplied with power by a buried electrical lead coming from the shed. The system is fully monitored with a Trimetric digital meter from Bogart Engineering, so Scott always knows how much current is going in and out, and what state of charge the batteries are in. What can the Van Wagners run with their small solar array? Plenty. Besides powering the lights and many of the appliances (the range and the fridge, wisely, run on propane) they use sunlight to operate the zone pumps for the in-floor hydronic hot water heating system, and to pump water directly from the 185-foot well. There’s an unmistakable harmony in that thought.